You might remember a while ago, I mentioned that Mat & I were going to be saving for a deposit to buy our own house. With Mat making the decision to go from self-employed to working for a company and my complete lack of saving superpowers, it just didn’t work out. Once we were back on our feet, with Mat recently securing an awesome new job and the mammoth tax rebate I received from the tax man, we decided it was time to start looking for our own flat/house to rent. I’d gone from paying a low rent while living at my friend’s house to living rent-free with Mat’s parents, so it did shock us both to see how inflated rent has become, even in Stockport. We’d looked and looked and looked. Zoopla, Rightmove, Onthemarket… nothing impressed and felt quite like ‘us’. It was really disheartening. Mat’s mum purchased a cheap terraced house last year with the view to do it up and rent or sell it, depending on the market of course. Now things are really kicking off with the renovation work and it’s going at a much faster pace, she kindly asked if we’d like to live there and rent from her while we save for our own house. Eek!! The house itself is a two-bedroomed end terrace house, which was previously occupied by an elderly man who hadn’t updated it in years. The bathroom was accessed through the second bedroom and the toilet was just off the kitchen. It was very unloved, outdated and needed stripping back to the brick in every room. The bathroom has now been knocked through and some space taken from the second bedroom to form a new bathroom, accessed from the hallway rather than the bedroom. Much better! 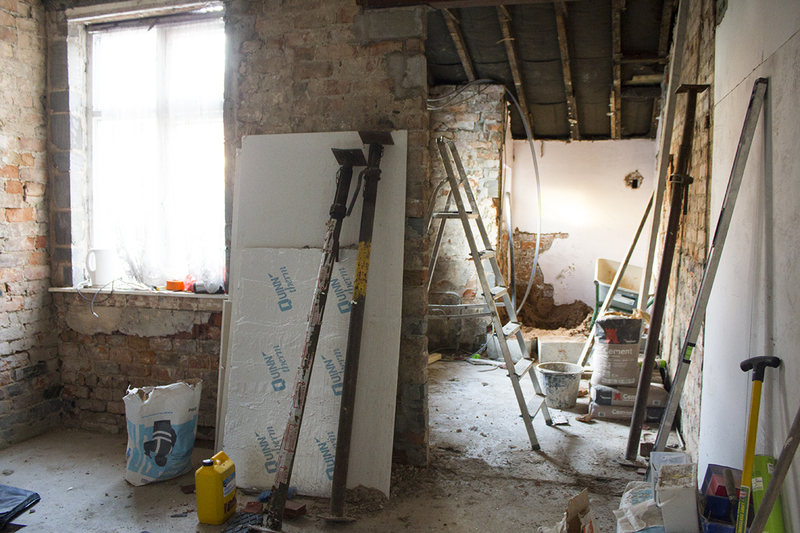 The wall separating the kitchen and dining room has also been knocked through, forming a more open plan cooking and dining space, and the toilet at the back of the kitchen is gone too, making more room for the kitchen. Even though the house renovation has progressed quite a lot in the past few months, we’re still a long way from completion. There’s still patio doors to be installed from the dining room out to the garden, plastering on all of the walls downstairs, a fireplace to be put in, a new bathroom & kitchen to be chosen, bought & fitted, radiators to be fitted and probably a few other things I’ve definitely missed. And that’s all before we start painting and decorating and buying furniture! The exciting bit is that even though we’ll be renting, we still get to be fully involved in the renovation. We’re choosing our bathroom suite (already pricing up my roll top bath! ), kitchen, flooring, wall colours etc., which means it will be a home that feels more like ‘us’ than anything on the rental market possibly could. 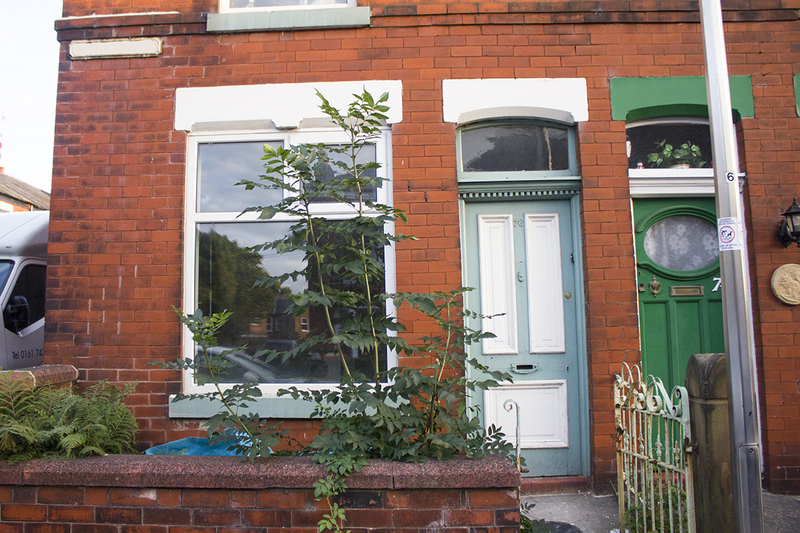 I’m going be to sharing it all on here, from the before and afters to the interiors inspiration, so hopefully any first time buyers can be inspired to take on a similar renovation project. We’re going to make it look awesome, so I hope you’ll follow our little renovation journey. In there and finished by Christmas? Let’s go! Remember to follow me on Pinterest to see all of my interiors inspiration. Have you embarked on a renovation project (big or small) before? I’d love to see how you got on!